As I alluded to on Sunday, two of my dear friends welcomed a little peanut (human) into the world this week. She’s six days old today and I get to meet her this afternoon (!). Since she probably won’t understand anything I tell her today, I’m blogging her a list for future reference. 1. Lots of people love you. 2. Your parents are super cool. There might be a time between ages 10 and 20 when you don’t think so, but you’ll come back around. 3. Your super cool parents might embarrass you sometimes. You can get back at them by telling your dad you’re a Centrist (but only say it if you don’t really mean it; he loves that). 4. You were born into a world with a lot of problems, but you’re surrounded by incredible role models. There are problem-identifiers, solution-makers, strategic thinkers, beauty-seekers, doers, fixers, connectors and all-around kindhearted people. Your world will be full of opportunities, no matter what path you choose. 5. It’s okay to fail, whether you’re building a Lego castle or a business. Everybody fails. Just pick up the pieces and try something else. 6. Your mom will know if you’re smoking pot in the bathroom or hiding cigarettes in the car. She just will. 7. You and I are going to make some dances together. I’ve already come up with a few ideas, but I welcome yours as well. 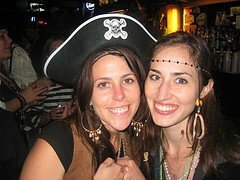 Your cool/embarrassing mom and me back in 2006 when we were pirates.